Europa, one of Jupiter’s many moons, is hiding a secret beneath its icy crust, but humanity is closer than ever to cracking it. Thought to possess a vast subsurface ocean of liquid water, the fourth-largest Jovian moon is a tantalizing place that could have all the right conditions for extraterrestrial life. In fact, NASA is currently designing a devoted mission, called the Europa Clipper, to possibly reveal its habitable potential. But scientists didn’t need a new spacecraft to make this ground-breaking discovery; they studied old data from a spacecraft that was exploring Jupiter in 1997. That’s according to a May 2018 study published in the journal Nature Astronomy. NASA’s Galileo mission orbited Jupiter from 1995 to 2003, and it revolutionized our understanding of the gas giant and its breathtaking array of moons. During a 1997 flyby of Europa, the spacecraft recorded a small yet bizarre bend in the moon’s magnetic field that, until now, had no explanation. But with the help of the Hubble Space Telescope, the mystery behind the magnetic anomaly may have been solved — and it could reveal a leak in the moon’s icy crust. Hubble made headlines in 2012 after it detected what planetary scientists thought looked like water vapor being vented into space from Europa. Like Saturn’s little moon Enceladus, which also possesses a subsurface ocean of liquid water, Europa is believed to exhibit geysers blasting through cracks in the ice, too. Unlike Enceladus, however, Europa’s venting water plumes have been a lot more subtle and difficult to observe. During a presentation about the possible detections of Europa water plumes, Xianzhe Jia — who works at the University of Michigan in Ann Arbor and is co-investigator for two instruments that will fly on the Europa Clipper — was inspired. The presentation was by Melissa McGrath of the SETI Institute in Mountain View, California, and a member of the Europa Clipper team. McGrath was describing the locations of the possible water plumes as observed by Hubble. Remembering magnetism measurements recorded by Galileo, Jia and his team dug into the old Galileo data to see if there were any anomalies. In the May 2018 published research, Jia’s team applied modern computing to the Galileo data to give scientists a fresh insight to what the 1997 observations really meant. So, what happened when Galileo zipped past Europa 124 miles (200 kilometers) above the moon’s surface more than two decades ago? Learning from NASA’s Cassini mission, which flew through Enceladus’ impressive water vapor plumes on several occasions, scientists know that when water vapor is vented into space, the resulting plume becomes ionized — the particles in the gas get charged up. As the plume interacts with the magnetic field, a characteristic “blip” in the magnetic field is recorded, so Jia’s team looked for this magnetic blip in the Galileo data. And they found it. 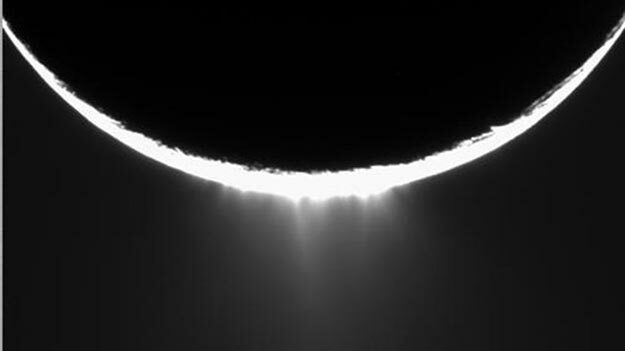 The Cassini mission captured this image of jets erupting from Enceladus’ south side. 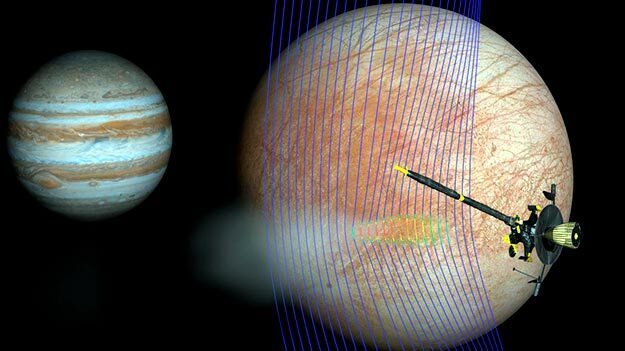 In addition, Galileo also was measuring plasma waves caused by charged particles around Europa, so the researchers also pored through those observations to reveal that, yes, they also indicated that Galileo fortuitously flew through a plume. Although these lines of evidence suggested the presence of a plume, it took sophisticated modern computer models to make sense of all the data. This discovery couldn’t come at a better time. The Europa Clipper mission could launch to Jupiter as early as 2022 and, should plumes be commonplace, the spacecraft will be able to take direct samples of the water vapor to study what chemicals it contains, revealing the habitable potential of the hidden ocean below. 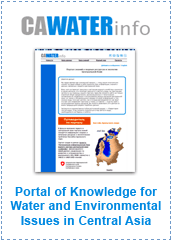 Dear User/Visitor! Please, answer on our questions: tick off one of the positions – your answer will make us able to improve our site and make it more interesting and useful!